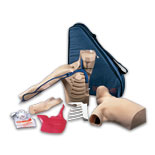 We provide certifications IV insertion and care, and central catheter maintenance. Following guidelines of the Infusion Nurses Society (INS), we bring programs to your facility that are customized to meet the specific needs of your RNs and LPNs. All programs cover aspects of legal liability, theory and practicum, and include use of anatomical models for classroom practice. In addition, the PICC Team can provide instruction in use of PICC lines and Mid lines, including training in advanced ultrasound-guided placement. All training programs are conducted at your facility, with your patients. Give your staff an opportunity to train alongside the PICC Team, providing them with a hands-on, focused experience in advanced IV therapies. There is no better, faster way to enhance your staff’s professional skills and ability to care for their patients.